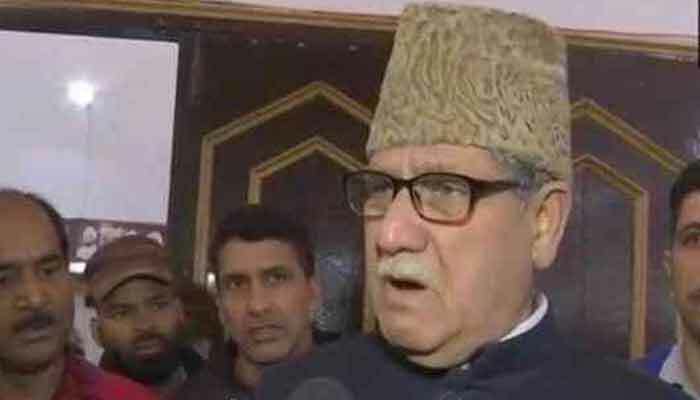 "If anyone speaks ill of Pakistan, I will abuse him ten times"
SRINAGAR: National Conference (NC) leader Muhammad Akbar Lone, who is also candidate from Kupwara parliamentary seat, on Saturday raised pro-Pakistan slogan, saying he will be abusing those who hurl abuses at Pakistan. Addressing a public rally at Kupwara in Indian Occupied Kashmir (IoK), Akbar Lone said .“The other side of this is a Muslim country, it should remain prosperous and successful. Our friendship with them should intensify. India and Pakistan should have a friendship with each other and I am an admirer of this friendship. If anyone will abuse them once, I will abuse him ten times from here,” he said while addressing a public rally on Saturday. Last year, Lone also raised pro-Pakistan slogans in response to BJP’s slogans against the neighboring country. In December 2017, Lone had claimed that BJP and People’s Democratic Party (PDP) leaders eat beef and pork together.